I don’t know how one maintains such full-on, no turning back, large sized commitment to such imagery, but it works. And some of them are poignantly humorous. “German” is the only explanation I can come up for, thinking about how someone could have the commitment and confidence. It’s almost impossible to think of someone with any sense of American artistic conventions or taste—anyone educated in American university art programs or familiar with criticism and theory here—making these. I agree about the humor. 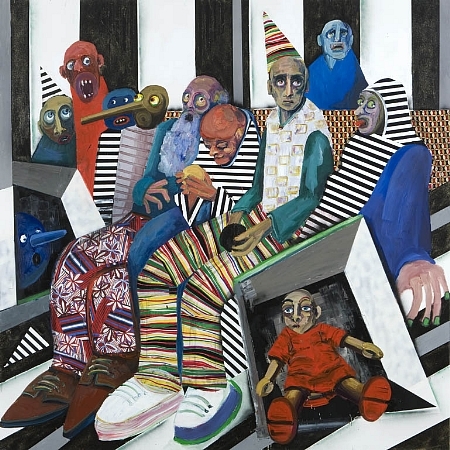 The paintings that have a sort of focal point of humor in a sort of unexpected part of the painting, like the oversized feet and patterned pants in the image above, seem to really nail that humor and poignancy. Yeah. The one above and the one that’s titled something that seems like “Pajama Party” are the real winners, having morbidity and humor, but not a morbid sense of humor.